Spontaneous abortion: is an expulsion of all or part of the products of conception before 20 weeks of gestation. 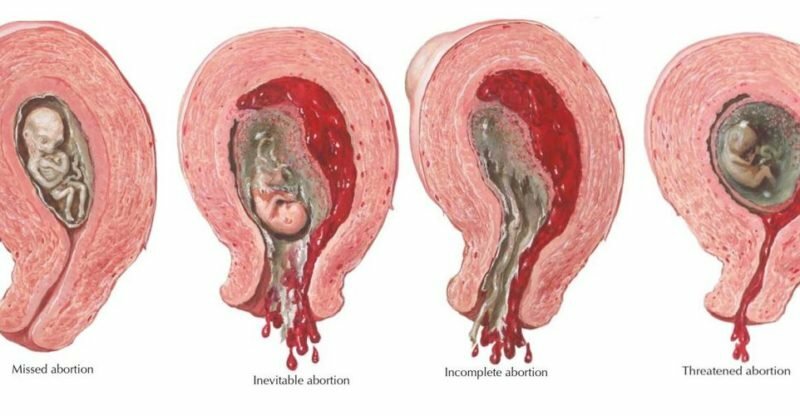 Threatened abortions: bloody vaginal discharge before 20 weeks of gestation with or without uterine contractions in the presence of a closed cervix. Incomplete abortion: dilated cervical os with passage of some but not all products of conception before 20 weeks of gestation. Inevitable abortion dilated cervical os without passage of tissue before 20 weeks of gestation. Missed abortion: is death of the fetus before 20 weeks of gestation, with products of conception remaining intrauterine. All women with early pregnancy bleeding and pain are assumed to have ectopic pregnancy until this diagnosis has been excluded by laboratory and imaging studies. Spontaneous abortion is defined as loss of pregnancy before 20 weeks gestation. Excessive bleeding before 20 weeks gestation in a pregnant women may indicate a nonviable fetus. 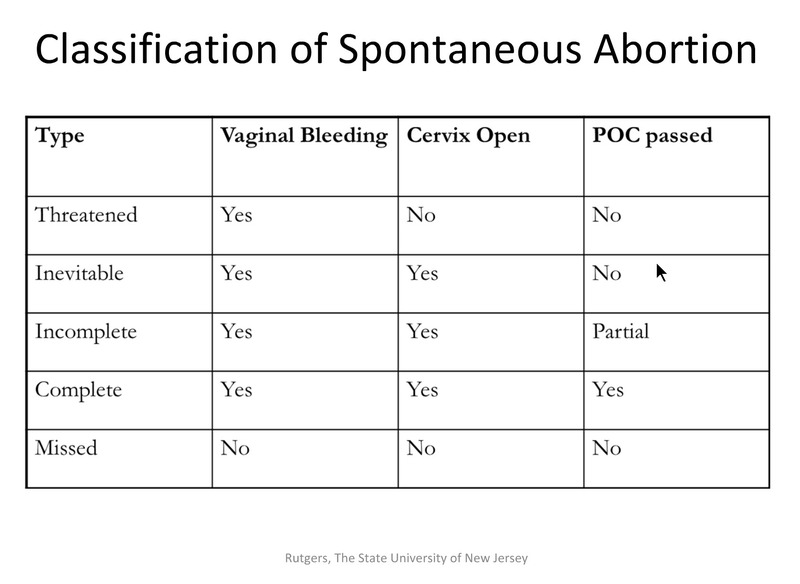 Types of spontaneous abortion include threatened, inevitable, incomplete, complete, and missed. 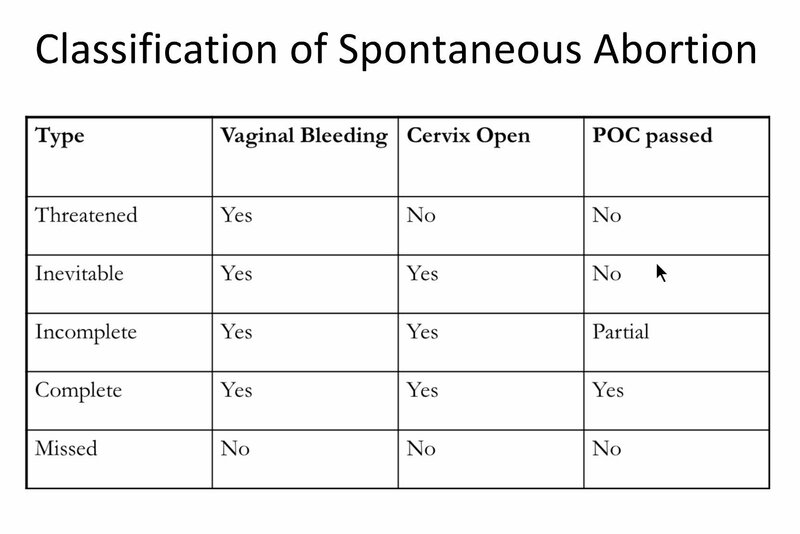 Identifying the type of spontaneous abortion is critical for determining subsequent treatment. Interventions include promoting bed rest and providing emotional support. Since fluid imbalance may occur in spontaneous abortion, monitoring for hemorrhage includes saving the patient's pads and linens. The administration of RhoGAM may be necessary for Rh- women exposed to R+ blood of nonviable fetuses. 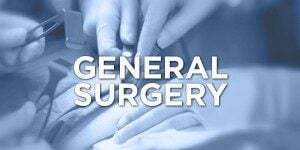 Dilation & curettage and cerclage may be done to remove fetal tissue from inside the uterus. Which of the following is a maternal risk factor for spontaneous abortion? Maternal risk factors for a spontaneous abortion include maternal infections (e.g., herpes simplex), uterine defect, endocrine abnormalities, drug use (including tobacco use), immunologic factors, and physical trauma. This patient is most likely experiencing an early pregnancy loss (also called a spontaneous abortion, nonviable pregnancy, or early pregnancy failure), which is defined as a spontaneous pregnancy loss at less than 20 weeks of gestation based on the last menstrual period. Because the patient appears to be hemodynamically stable on the basis of your phone conversation, it is reasonable to have her evaluated first thing in the morning in your office. Furthermore, you already have preexisting documentation of an intrauterine pregnancy, which makes the possibility of an ectopic pregnancy highly unlikely. The concomitant presence of an ectopic and intrauterine pregnancy (referred to as a heterotopic pregnancy) is possible but is a very rare occurrence, with an incidence of 1: 30,000 pregnancies. Reports estimate that heterotopic pregnancies are on the rise, with an incidence as high as 1: 2600 pregnancies among certain high-risk subgroups, such as women who have undergone assisted reproductive interventions (e.g., in vitro fertilization). Although sending the patient to the emergency department immediately is a possible option, this will likely cause unnecessary waiting and anxiety for the couple. 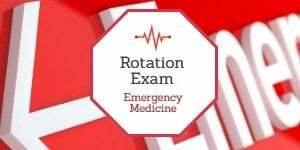 An immediate D& C is not necessary, given the fact that the patient is stable and not bleeding excessively. Most early pregnancy losses can be managed safely and effectively in the family medicine setting; a consultation with an obstetrician-gynecologist is not mandatory and will depend on the clinician’s level of clinical comfort. Telling the patient to take ibuprofen and follow up at her next prenatal visit is not appropriate in the setting of undiagnosed first-trimester bleeding. The patient is experiencing an incomplete abortion. The terminology to describe nonviable pregnancies was devised before the advent of ultrasonography and can be confusing. Traditionally, nonviable pregnancies are divided into different categories based on physical examination findings: (1) a threatened abortion refers to vaginal bleeding, with or without cramping, in the presence of a closed cervix; (2) an inevitable abortion refers to a dilated cervical os without the passage of tissue; (3) an incomplete abortion refers to a dilated cervical os with the passage of some but not all products of conception; and (4) a complete abortion refers to the complete expulsion of the products of conception. Recurrent spontaneous abortion refers to three or more consecutive pregnancy losses. In clinical trials, an embryonic or fetal demise has been sonographically defined as an embryonic pole or crown-rump length between 5 and 40 mm without cardiac activity. An anembryonic pregnancy (commonly called a blighted ovum) refers to a gestational sac with a mean diameter between 16 and 45 mm without evidence of a fetal pole, inadequate growth of the gestational sac, or an increase in β-hCG levels of less than 15% during a 2-day period in the presence of a yolk sac visualized on ultrasound examination. 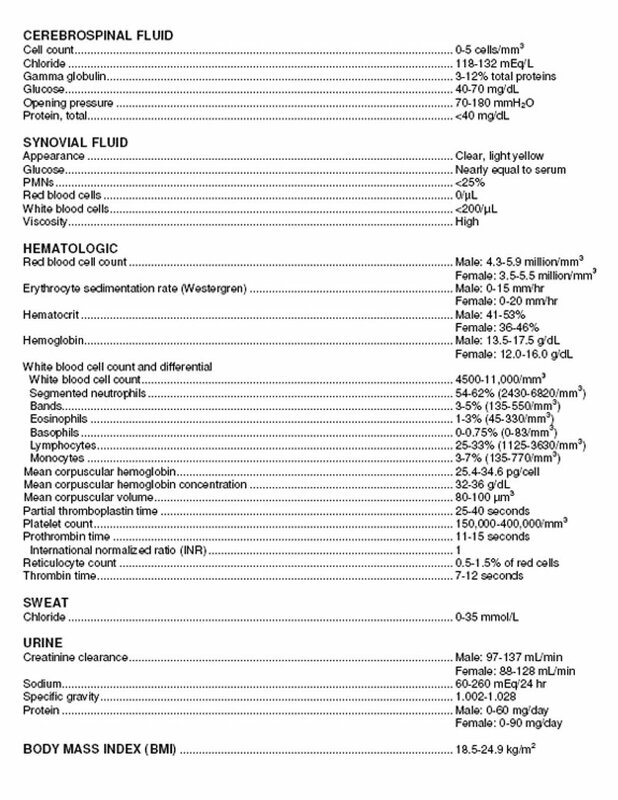 Traditionally, clinicians performed immediate D& Cs to treat spontaneous abortions. Recent evidence provides support for the role of expectant management and medical management instead of surgical intervention. 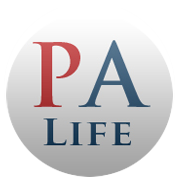 Expectant management allows the patient time to complete the process of spontaneous abortion on her own. This process can occur during the course of 2 to 4 weeks, depending on the patient’s clinical symptoms and the patient’s and clinician’s level of comfort with waiting. Clinicians can monitor the progress of an ongoing pregnancy loss with serial β-hCG levels or ultrasound examination. 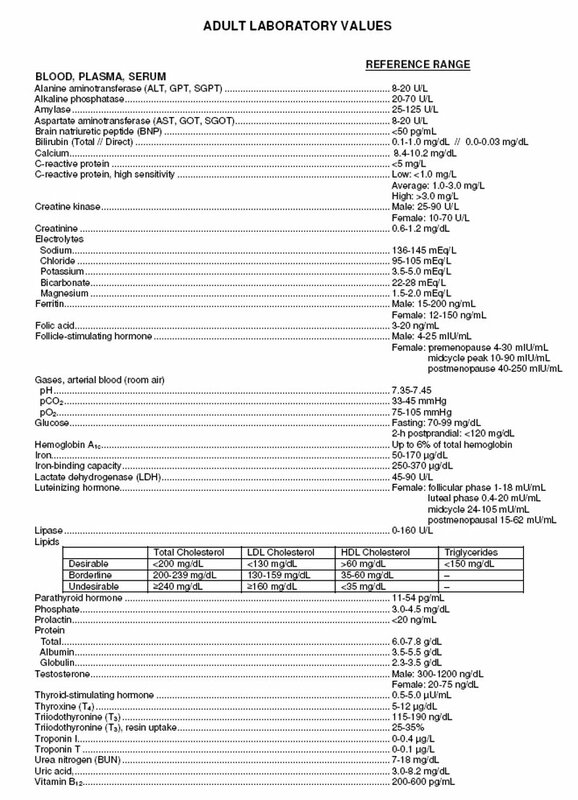 The β-hCG level should double approximately every 48 hours in a viable intrauterine pregnancy. A rise of less than 50% is associated with an abnormal pregnancy. A change of less than 15% is considered to be a plateau, which is most predictive of an ectopic pregnancy. For incomplete spontaneous abortions, the success rate of expectant management is excellent at 82% to 96%. However, the success rate of expectant management declines with anembryonic pregnancy or fetal or embryonic death (25% to 76%). A 25-year-old female, G2 P1001, presents to your office at 11-weeks gestation with vaginal bleeding, mild lower abdominal cramping, and bilateral lower pelvic discomfort. On examination, blood is noted at the dilated cervical os. No tissue is protruding from the cervical os. The uterus by palpation is 8-9 weeks gestation. No other abnormalities are found. Which of the following is the most likely diagnosis? Threatened abortion is characterized by bleeding in the first trimester without loss of fluid or tissue. Complete abortion refers to a documented pregnancy that spontaneously passes all of the products of conception. Incomplete abortion is when the cervical os is open and allows passage of blood. The products of conception may remain in utero or may partially extrude through the open os. Inevitable abortion is the gross rupture of membranes in the presence of cervical dilation.